Supernova 1997bs was discovered by the Lick Observatory Supernova Search (LOSS) Team as it occurred on April 15, 1997 at 13" west, 67" south of the galaxy's center and reached mag 17.0. This supernova was of peculiar type IIn. Recently, Van Dyk et.al. 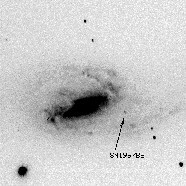 (2000) have speculated that supernova 1997bs, together with a few others of same type IIn, including SN 1961V in NGC 1058 and SN 1954J ("Variable 12") in NGC 2403, may more probably have been Eta Carinae-like outbursts of supermassive stars than proper supernovae explosions. The gorgeous image displayed in this page was obtained by Martin Altmann of the Sternwarte Bonn and is copyrighted. The 17th-mag supernova is visible just right of the lower edge where the bright lower spiral arm curves out from the central region (compare discovery image below, and click to get a full-size version of the image showing the SN more prominently). Discovery image of SN 1997bs from Katzman Automatic Imaging Telescope (KAIT) of April 15, 1997. 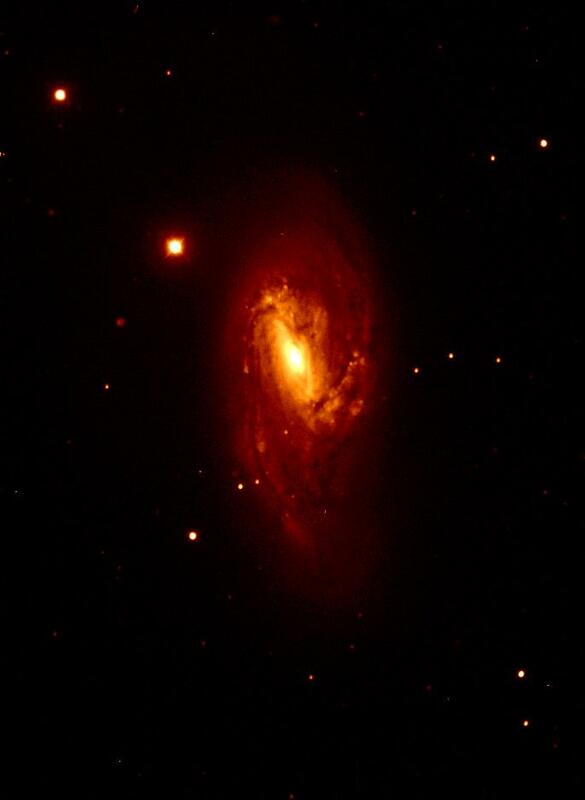 An image of this SN is printed in Astronomy Vol 26, No. 9 (Sep 1998) p 62.